This was our first day in Bali and the Tamukami Hotel was fantastic. Nice athmosphere, personal an location. Een Balinees paradijs met een heerlijk Belgisch sausje, dat is Tamukami ten voeten uit. Een plek om je ver van huis toch thuis te voelen ! Een fantastisch moment in mijn leven dankjewel daarvoor !. We only stayed here for two nights and its the first time staying here ( room the first time in Sanur, in Bali! ) and have been impresed as always with the Balinese welcome. The scents ,sights and sounds of this beautiful island are all personshed in this hotel / restaurant. Good times, great food, nice pool and lovely atmosphere ! We'd come back with no problem ! Great stay ! Very relaxing and beautiful. We enjoyed staying at Tamukami. Staff so pleasant, pool lovely very well mentained hotel + so clean. We will be back, Thank you. Many thanks for a delightful stay. We had a restful holiday and will be looking forward to our next visit ! Exellent place to stay. Staff are very friendly. Lovely rooms and pool. Thanks for a great holiday. P.S: See you on our next visit Bali. Excellent place. We had a great time, food, music, pool and staff wonderful. We had a wonderful time. So beautiful. Smiling staff, good food & music. Na 3 jaar terug voor 3 weken in Tamukami. Hartverwarmend weerzien, maar het was weer veel te vlug voorbij. Prachtig hotel met tropische tuin, aantrekkelijk zwembad, ruime kamers ers. Het restaurant heeft ons weer verwend met lekkere gerechten en muzikale optredens. En dit alles het leuke Sanur en zijn strand. Grootste troef is en blijft het vriendelijke en gedienstige personeel, waarvan vele vrienden geworden zijn. Speciale dank aan papa Eugeen en mama Suzanne voor 20 mooie dagen. Amazing stay with a family feel. Lovely rooms, beautiful pool area, delicious food and great music. A very enjoyable staff. We'll be visiting again. Thank you! What a perfect place to stay when in Sanur! Thank you so much for your hospitality, we had a great stay for our nearly two weeks in Bali. Thanks to Alise's Restaurant for her birthday party. We passed four weeks in Bali. We visited five hotels. They were all oke. But the best one was Tamukami. Situation quiet. Room very clean and good service. But for all the staff! Friendly and all very helpfull. We can accomodate Tamukami to everyone !. Thanks! Thank you so much we had a lovely time here, everybody was very friendly. We had a delightful three days at this lovely hotel. The staff were wonderful and very helpful. We will be back and will recommend it to all over friends- particularly the suit. We had a lovely time here. Our daughter loved the fullmoon-night! Trés bel hôtel, bon séjour merci. Hotel magnifique, personnel charmant, jardin extraordinaire. Bali dans toute sa splendeur. Thank you for a wonderful stay. You made us feel very comfortable & welcome. Thank you for lovely stay. This really is a little bit of paradise. And a lovely place to spend my birthday. We hope to see you again. To all at the Tamukami. Thank you for making our stay so wonderful, 6 nights has been far too short so we will have to come again. We had a wonderful stay at Tamukami. Thanks to all the friendly staff for making our stay so memorable. The hotel amazing and has got a wonderful relaxing atmosphere. Nous avons passé un trés bon moment, dans cet hotel trés agrèable et trés silencieux. Belle piscine et trés bonnes prestations. Very good stay. Wonderful place to stay very quiet, peaceful. But only had 5 days. We hope to be back soon. This is our third time to Tamukami & we love coming here to stay. The staff are terrific friendly & very helpful. The rooms are fantastic & have a great breakfast to start the day. 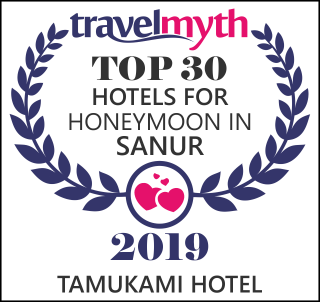 Congratulations to Tamukami for being a wonderful place to stay. See you all next time. Great rooms and a very cozy tropical garden. Excellent service. Thanks for a top !. 2 days. Our first time in Bali and our first time at Tamukami. But we will definitely be back. Absolutely beautiful. Thank you for a wonderful place in paradise. Found Tamukami by chance, had a great stay, staff are friendly, food is excellent and clean room. Thank you for making our holiday in Bali a wonderful one. Thanks for the lovely stay. It was a great a relaxing time. Hope to see you again very soon. We really enjoyed your hotel. The garden area around the pool is absolutely, beautiful and the room was very comfortable. Had 6 really nice days here, very friendly place and always staff to take care of everything. Enjoyed the stay very much. Our stay with you was very pleasant. Thank you very much to all the staff. Obwohl wir nur eine nacht hier ubernachtet haben, haben wir diese Zeit sehr genossen. Eine sehr schöne Anlage " eine kleine Oase " in Sanur. Vielen dank for die schöne Zeit. Wir hatten einen sehr angenehmen Aufenthalt hier. Man glaubt es kaum, dass nur wenige Meters von der Strasse ein solches kleines " Paradies " Liegt. Wir wünschen das Hotel und die ganze Anlage alles Gute fur die zukunft. Thank you for a lovely stay. What a pittoreque hotel. Hope we can visit again. Thank you again for a nice time. It's not our last stay in Paradise. This was our first time in Bali " I love Bali & Tamukami " I will be back to this little piece of paradise. The staff are wonderful and the hotel & pool is beautiful. Thank you, I will be back again. See you soon. Thank you for a wonderful holiday. I will be back and will stay at Tamukami. Thanks again for such a wonderful time again. It feels like coming home. See you again soon. Thank you to the staff for a wonderful stay. 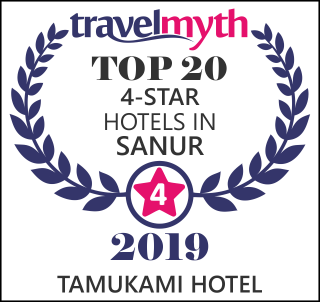 We enjoyed the atmosphere at Tamukami and found it to be more of a Balinese experience than some of the other hotels we saw. Cadre superbe. Ambiancè extemement familialee, donc très convivian. Une très belle oeuvre de nos amis belges qu'il convient d'apprecier à la juste valeur. A reconmander absolument aux amoureux de la serenité. What an excellent place to sit back and relax. Just a step away from the shops and beach, nice cozy atmosphere with lovely staff. Thank you very much for our stay. Lovely place. Only problem is the room towels very very thin and small. Un site magnifique, un accueil genereux et un personnel très gentil sons, sans parler de la cuisine que nous avons appreciée. Merci nou reviendrons vous voir !. A truly great stay. I was on Business but the staff made me feel like a vacation. A thank you. P.s : I will recommend on Trip Advisor. Suksema. Unos dias inolvidable. Amabilidad siempre buena. Que mas se puede esperar. Es war ein wundervoller Aufenthalt hier. Alle waren so nett und freundlich. Alles war sehr sauber. Einfach tolle erholsame Ferien hier. Horzlichen Dank fur alles. Thank you for this wonderful stay. Very good spacious rooms. Everything very clean but most of all very friendly people. Hopefully till a next time. Hi Tamukami, a short night only...very nice setting & staff. Dear all of you. Thank you very much for pleasant stay at your hotel. My daugther will come here on May 28 for one night. All the best from Hanne Krogen. Very nice place, kind people just perfect. Thanks to all. Very relaxed atmosphere, staff very helpful. Great time at the Tamukami. I will recommend the Tamukami to my friends. Beautiful serene surrounding, clean and very friendly helpful staff. A pleasure to be a guest here and will certainly come back again in the future. Very nice place. It's wonderful. Excellent accueil, excellent environnement. Très grande gentillesse. Très bon souvenir. We had an excellent week here and we find the hotel very helpful in assisting us. We have an enjoyable stay and we will definetely be back. Thanks to such a wonderful staff. We willen iedereen van het hotel bedanken voor het fantastisch verblijf. Iedereen was ontzettend vriendelijk, behulpzaam en altijd met een glimlach. We hebben er ontzettend van genoten om hier ons huwelijksreis door te brengen. Onze complimenten en hartelijk bedankt. Have enjoyed my stay here. Very beautiful will come back. Have enjoyed our stay here again, everyone so kind & helpful, a beautiful little hideaway & perfect paradise and everything was perfect could not be better, the soonest my husband and I can come back the better. Had a lovely holiday. Thanks to all staff. Will be back shortly, I hope. Séjour enchanteur ā l'hotel TAMUKAMI avec un personnel accueillent et très profesionnel. J'espere que je reviendrai.